Air is crucial to life. We will die without air. That’s quite obvious. However, we may also gradually die from overexposure to air pollution. Our body needs clean air now more than ever especially that rapid urbanization has left most cities polluted and smog-filled. Air pollution is actually our fault. We were too consumed by our fascination with technology that we forgot to take into consideration its impact to the environment, especially to the very air we breathe. If there is any other place on the planet that is known for extreme air pollution issues, it would have to be China. 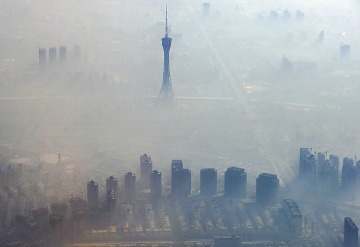 The most populous country in the planet, many Chinese are facing each day in a world full-of smog and polluted air. While we may not entirely get rid of air pollutants, they should be at an acceptable level so as not to pose health risks to everyone. It is why it’s not uncommon to see individuals walking the streets wearing face masks because it is virtually impossible to breathe clean air in most major Chinese cities. The central government declared war on pollution in China four years ago, but progress has been limited. The environment ministry said last week it found that thousands of polluters had faked emissions data or resisted checks made by inspectors from mid February to mid March. The three-month average reading in the 28 cities of PM 2.5, the small particles in smog deemed most harmful to health, was 103 micrograms per cubic metres, the ministry said. This was a rise of 12 per cent from a year earlier. Readings over 101 are ranked as unhealthy for sensitive groups and members of the public are urged to limit the amount of time they exercise outdoors. Levels of PM10, slightly larger particles of pollutants, averaged 160 micrograms per cubic metres in the cities from January to March, unchanged from the same period last year, the ministry said. The ministry said in a separate notice published on Wednesday that it would send 5,600 inspectors on a year-long investigation into the sources of air pollution in major northern cities, the largest such campaign ever undertaken nationally. If California is the most polluted state in the United States, China earned the title in the whole world. And millions of Chinese live in this unhealthy environment despite the government’s effort to address air pollution issues. The Chinese government is intensifying their efforts but the threat remains the same and is probably worsened by other equally controversial topics like climate change and global warming. China experiences one of the highest rates of air pollution in the world. The quality of air remains poor in its cities and industrial towns for most part of the year. A new research published in journal Science Advances has said that part of the reason for this is changing weather. The paper studied the climatic conditions and air pollution in China and found that poor air quality continued due to extremely poor ventilation conditions, which were caused by Arctic sea ice loss and the weather changes that followed. Scientists studied China’s climatic condition from January 2013 using satellite data and visibility measures. As per the paper, January 2013 saw unprecedented large-scale haze that continued for almost an entire month. During this so-called “airpocalypse” period, close to 70 per cent of the 74 major cities exceeded the daily PM2.5 ambient air quality standard of China. The researchers also analysed sea ice, snowfall and large-scale weather patterns. They found a connection between stagnant air conditions and Arctic sea ice concentration, snow cover in Eurasia, El Niño/Southern Oscillation, and others. Climate change plays a role in changes in these conditions, for instance, sea ice concentration is being depleted due to increased warming. They created atmospheric models to study how those factors changed large-scale circulation patterns and pollution over eastern China. China’s skyline is often characterized by a smoky haze or a smog-filled skyline because that’s just how the air pollution issue has blown up in the country. Dealing with air pollution has been a part of every Chinese’s struggle in their day-to-day life. Of course, we all know how much of the products sold in the world today are made in China. The number of Chinese factories and manufacturing plants operating in the country are likewise factors on how the air pollution issue in China has exploded beyond comprehension. As of writing, the Chinese government has stepped up its efforts in cleaning the air by closing down factories and power plants to reduce circulating particulate matters. They are hoping the measures they are currently taking will offer relief, especially that even the aviation industry suffers as poor visibility is always a challenge for all airlines flying in and out of China. The health of all the Chinese will deteriorate if this air pollution problem persists, so we are hoping everyone is doing their part in addressing this issue because the government alone can’t solve this mammoth of a problem by itself.